YouTube video Trip #7 to Jackson Park/Crow Basin: SAW IT! SURVIVED IT! Which includes a list of all the YouTube videos made this year. Trip #7-2011 Jackson Park/Crow Canyon: WOW! SAW IT! SURVIVED IT! WHAT NEXT? NOTE: A portion of the slide show and YouTube video eventually seems to become a clown act which I share knowing that there are elements of it that will save someone’s life. 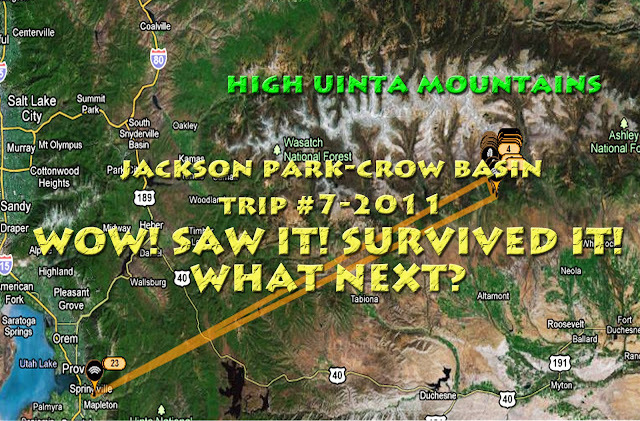 1,000 MILE BACKPACK IN THE UINTAS, then Trip #7-2011 Jackson Park/Crow Basin: SAW IT! SURVIVED IT! WHAT NEXT? 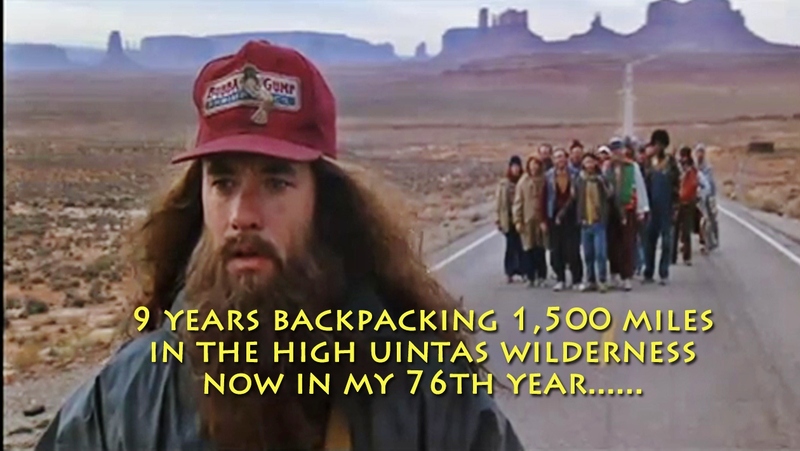 This show represents a bit over 1,000 miles of backpacking in 4 summers–from 2003 to 2006. Some of those miles entail trips to certain areas several times in the constant quest of that “perfect photograph,” or catching the “record breaking fish.” The Highline Trail was actually hiked twice in the 1,000 miles, the second time to have the experience of doing it with pack goats on invitation from Clay Zimmerman (http://www.highuintapackgoats.com/). On that trip, my adopted daughter from Guatemala, Mahana, became the first Guatemalan we know of to traverse the Wilderness. In the spontaneous narration there are a couple of mistakes, like once saying “crossroad,” rather than “crosstrail;” saying “Amethyst Creek,” rather than “Ostler Creek,” “Lost Lake,” rather than “Shadow Lake,” and the big one, stating King’s Peak in one place as being 15,528 ft. high rather than 13,528 ft. There might be a few more, but also the coordination between narration, and photographs is sometimes off a second or two. Soon I will redo the program and hope for better luck. 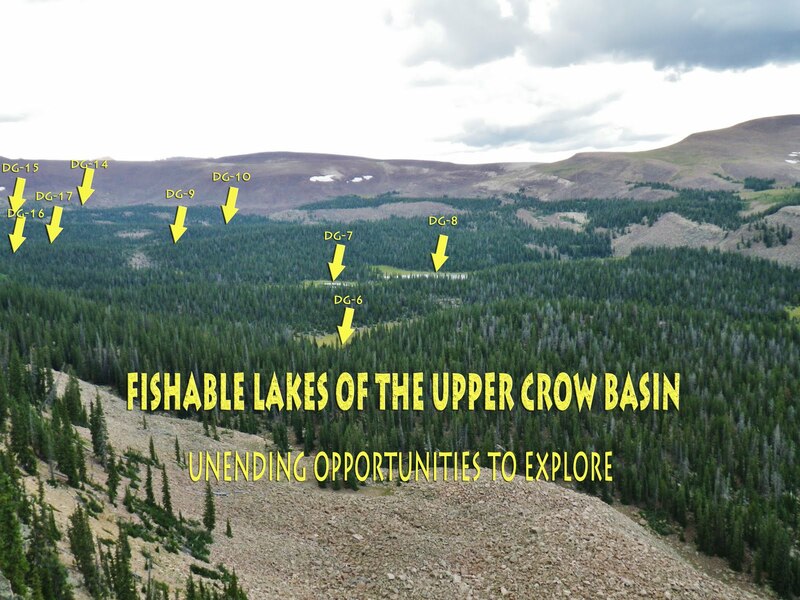 In the meantime, enjoy the beautiful High Uintas Wilderness like maybe you’ve never seen before. NOTE: A portion of the following eventually seems to become a clown act which I share knowing that there are elements of it that will save someone’s life. This post will be a slide show with a more complete photographic record and links to all related equipment and other important items. I promise you that from these links you will be able to get the best equipment at great savings–while earning for the Project a small commission. For more details on the best equipment and supplements to to my other sections. NOTE: Remember to see full screen/high resolution any image, just click on it. This was a pretty intriguing area that I had to try and get to. The Duchesne Ranger Station is a worthwhile stop to get up-to-date info, topographical maps, and more. It is 100 miles from Springville, and similar from SLC. Shiella, seen here, or Lori will give you the kind of friendly service that will get your trip off to a good start. A block down from the Ranger Station you turn left (north), cross the river and you’re on your way. The High Uintas have been called an “alpine island” in “Sagebrush Country.” Here we see sagebrush in the background and golden yellow Gray Rabbit Brush in the foreground. At Mt. Home the Rock Creek Store–Bed and Breakfast is worth a stop to get what you forgot. Stacie will be happy to help you with what you might need. By the way, the place is FOR SALE, so here’s your chance to live at a choice Gateway to the High Uintas. From there you continue up the paved road until you come to this sign, and turn right, or east. 24 miles from Duchesne. In a couple of hundred yards you cross the Lake Fork River that comes through Moon Lake. In about 8 miles you cross Yellowstone Creek–seen below on August 17th. Below is Yellowstone Creek in early July taken from exactly the same spot as above. 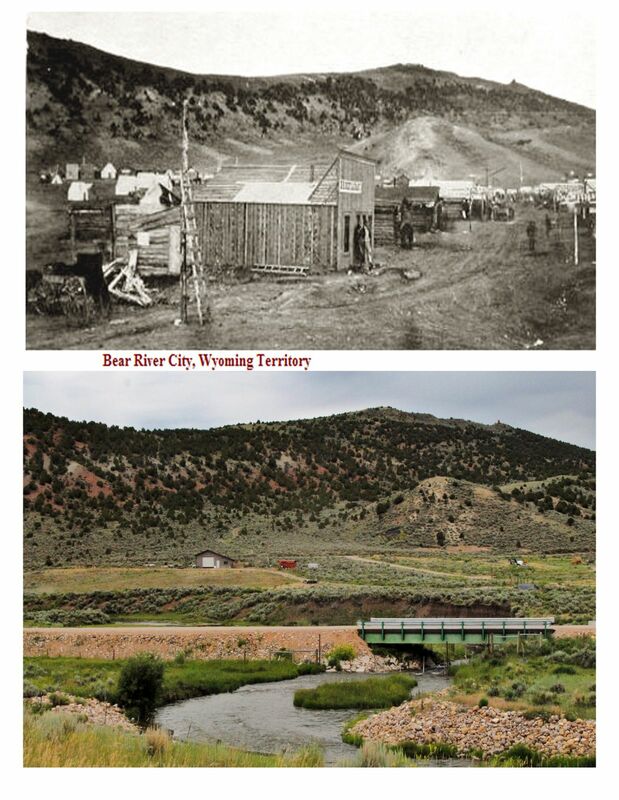 A bit past the Yellowstone Creek bridge you come to the Dry Gulch sign and turn east. This is 8 miles from the pavement. 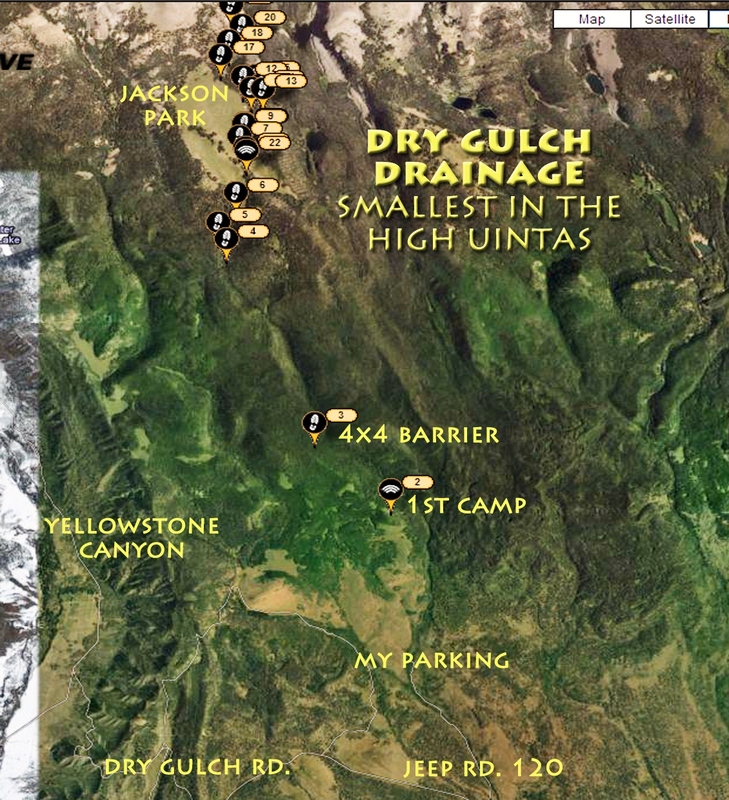 We are heading for the Dry Gulch Drainage, the smallest in the High Uintas. Continue east 5 miles to Jeep Road 120. Here turn north and drive carefully riding the high center. keep your eyes open and enjoy our beautiful outdoors. Then it got a bit too tough for my Olds Bravada. With a big pickup you can carefully get through this bad section and continue another 3 miles. As I parked to prepare to hoof it, a 4×4 pickup came down. I approached the two fellows to say hello. They spoke with a heavy accent and were not backpackers, hunters, fishermen, nor ranchers checking on their cattle. In recent years many marijuana farms have been found in remote areas of Utah, and I suspect that these guys were scouting the area looking for some good locations for such activity like you see below. So, Forest Service, be alert, and if any of us see something suspicious we should report it to authorities. I was to go “lightweight” like never before. My 13 lbs. of photographic equipment, and 2 lbs. of Colt Defender remained at home. My tiny waterproof Pentax Optio W-1 would do the photographic chores. All the photographs in this slide show were taken with this camera. My “basic pack,” pack, sleeping quilt, pad, tent and poncho came to 7 lbs. For rain-gear I used this inexpensive and lightweight set–about half the weight of my usual rain parka and waterproof pants. Many of you know of the incredible problems I have had with my feet and ankles (“football ankle”), and also what for years was my “motorcycle knee.” In 1994 I was advised by a specialist to “forget backpacking and running in half-marathons,” but I was stubborn and found a way to even do more–much more! To see a summary of this history and the solutions I found go to: WHERE DO I GET MY ENERGY? 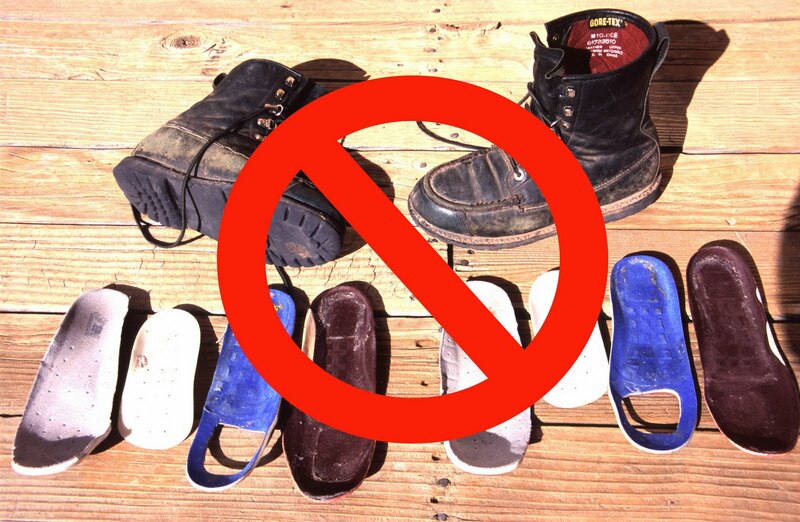 Eventually I was able to reduce the inserts and go to a very lightweight boot that gave me the ankle support I still needed for a couple of years. Then it got much better. For the last two years I was able to go to a waterproof Salomon low cut lightweight boot you see here on the left. For this trip I went with my waterproof Salomon Mountain Running Shoes. This saved me 5 oz. per foot of weight which you might say is not much, but in a half marathon you would be lifting 812 lbs. less weight! So I was ready to go with my Salomon Trail Running shoes that worked wonderfully on this trip. 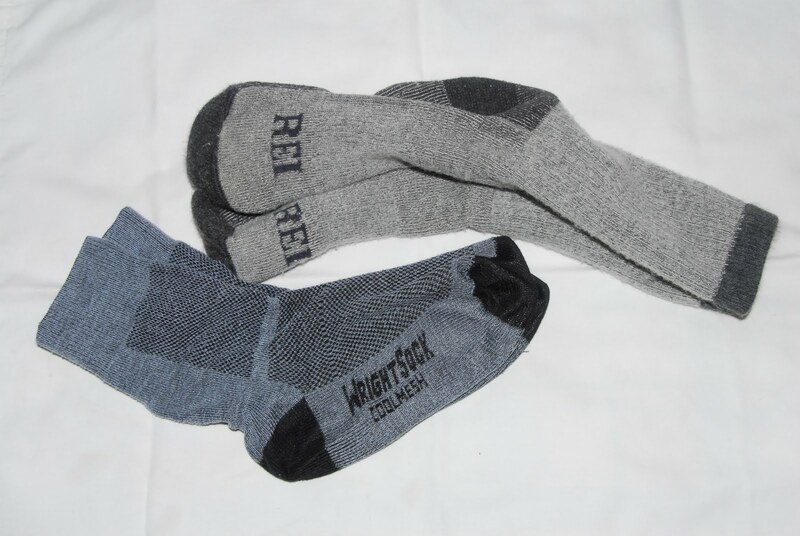 Of course I use the best quality socks, always with CoolMesh WrightSocks, that prevent blisters, next to my skin. Since I have used these for hiking and running I have never got a blister which previously was a frequent problem. 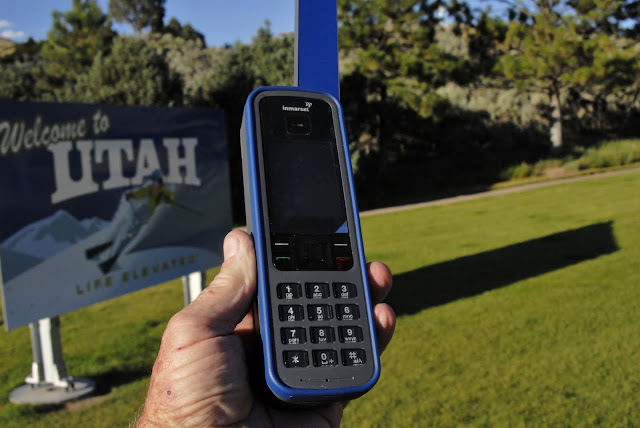 The 64 year old Australian lost in the Uintas had a Personal Locator Beacon, but he never used it. If he had of had a SPOT Tracker using it daily as I do, the outcome of his story would have been very different. 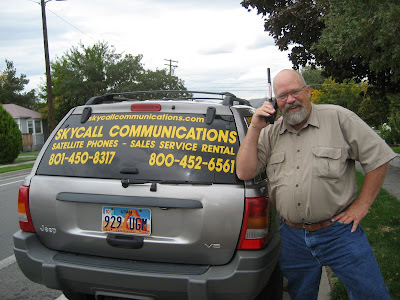 Then you see above the satellite phone provided by Russ Smith from Skycall Satellite, which I use to call my report in to KSL OUTDOORS Radio each Saturday morning, and of course for any emergency. You can rent phones and SPOT trackers from him. They are worth their weight in gold! Every group should have these crucial life saving items–THE BARE MINIMUM BEING THE SPOT TRACKER. Ready to go with around 30 lbs. of equipment, food and water. What a snap this was going to be compared to my trip to Swasey Hole when I had 54 lbs. (of course for 9 days), and my 83 lbs. when I left on my 27 day expedition in 2003–which 8 years ago I was able to handle (see the 1,000 MILE WHIRLWIND BACKPACK slide show if interested) . For the 9 day trip I had 24 more pounds of weight. In a half marathon if you are lifting 24 more lbs. with each step that adds up to a whopping 624,000 pounds!!!! If you are only 10 lbs. overweight you would be lifting 260,000 extra pounds during the race. Maybe we should focus a bit on having the right weight unless we are content with being couch potatoes, and not living a long, active life. Above is the Google Earth view from my Spot Tracker website showing what I was to do in the next few days. 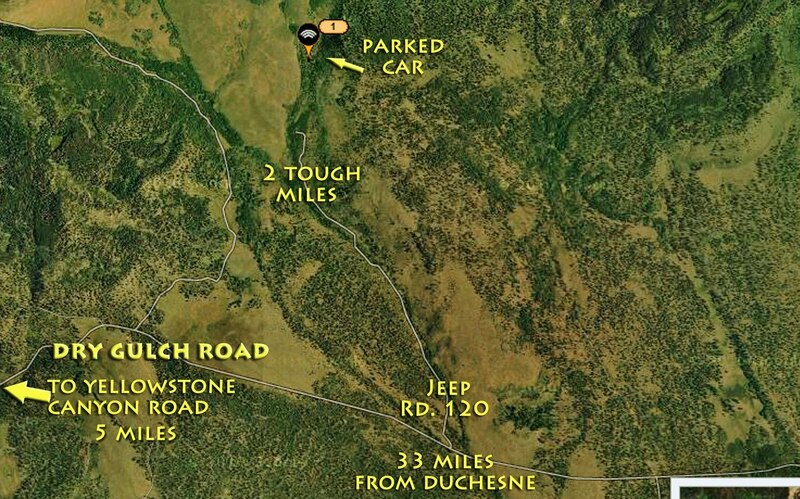 With a good 4×4 pickup you wouldn’t have to hike up the steep lower reaches of the route. Looking back at the Uintah Basin. False dandelion along the way. There are also true dandelions along the trail which you can eat as they are the “spinach of the weed world” and even more nutritious. If it’s rainy there are spots that would be messy. We are not in the Wilderness Area and so there are ATV trails in the area. Then you come to the barriers where you have to park if you are lucky enough to have got here in your 4×4. To this point I have hiked about 3 miles with no water available anywhere. My friend Ted apparently came up here 35 years ago when you could drive all the way to Jackson Park. This old jeep road even went all the way up to the Timothy Lakes years ago when dikes were built on some of the lakes to increase their storage capacity, and with head-gates release the water when needed down in the basin. To create my “bread crumb” trail and pinpoint coordinates, I hit the button at the barriers becoming Track #3 on the Google Map. From here I had about 3 miles to go to Jackson Park. “GLORY BE TO THE LORD!” ATV’s are prohibited! I hate those suckers–sorry about that. I was on an elk hunt in the Blind Stream area of the Uintas a few years back. I struggled up the mountain with backpack, and camped. The next day I persisted up the mountain into incredibly remote elk country and as I topped a ridge noticed a wiff of scent that was like….GASOLINE! Three ATV’s were parked in the shade of some pines. I drew down on them and almost squeezed the trigger I was so MAD! Up the trail gradually leaving behind the aspens, and seeing more deep forest varieties of flowers, like the heart leafed arnica. This lodgepole forest would have been tie hacker country on the north slope. Most of the way the trail followed the ridge with Yellowstone Canyon down to the left. There was no water, and I was out by that time. But, my map showed the trail would soon cross a stream…..
….and here it was, but….it was bone dry. If the stream bed coming out of Jackson Park was dry I figured that Jackson Park wouldn’t have any water….and I was OUT! What the heck would I do? I thought, maybe I won’t find any water until I drop down into Crow Canyon–assuming that to get down there was just a hop, skip and a small jump! Finally made it to Jackson Park which was pretty green with lush flowers. I was hopeful there would be some water. I was fascinated as usual with the flowers, this one being HOODED LADIES TRESSES. Thankfully there was a small, clear flowing, cold stream. It apparently just disappears into the dry stream bed a bit downstream. With one of my little bottles–the cheap, light ones you get with chocolate milk, I filled my Platypus bucket (“water tank”), and headed for my pack and shade to do the pumping/purifying. 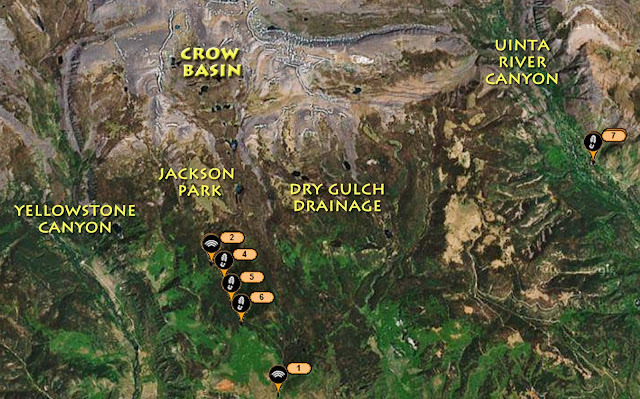 I got my MSR water purifying system going, while also hitting the SPOT tracker button to pinpoint my location as Track #6. During the off season I had installed a new micropore filter , and in a flash I filled my bladder. 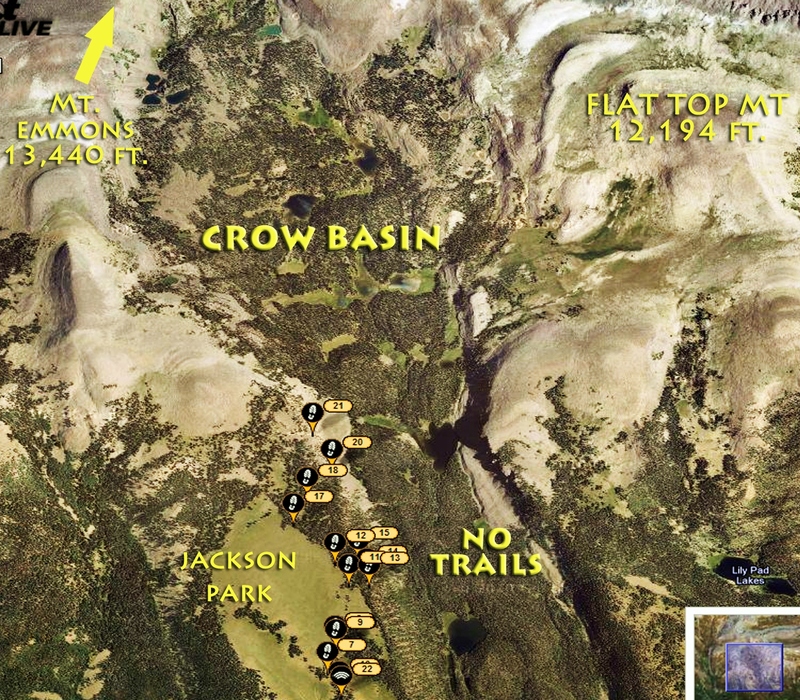 I started moving up through Jackson Park with the objective of eventually getting over to the edge and being able to look down into Crow Canyon and hopefully find a way to get down and then be able to move up into the upper basin. As perhaps mentioned there are no trails in the Crow Basin. Moving up Jackson Park. It is a beautiful meadow that stretches on what seemed like miles of grass and wildflowers. Way in the distance round boulder field mountains began appearing. I knew that further up this same ridge was Mt. Emmons, 13,440 ft., 4th highest in Utah.. Behind me was the hot, smoggy Uintah Basin. Among so many flowers was the Mountain Bog Gentian, very small up here, but always beautiful . The track continued north, the mountains looming larger. Mt. Emmons perhaps is the dark shadowy one just barely visible on the left. Way up this spur or ridge, that comes from the spine of the High Uintas, is 13,528 ft. high Kings Peak, Utah’s tallest mountain. But, between Kings Peak and Mt. Emmons is a no-name 13,387 ft. mountain I have named Mt. Jedediah, in honor of my greatest hero among the mountain men/fur trappers and explorers who opened up the West–Jedediah Smith. In fact I’d better insert a shot of this mighty mountain–seen below. Mt, Jedediah guards no-name lake U-75 in the upper Painter Basin of the Uinta River Drainage. 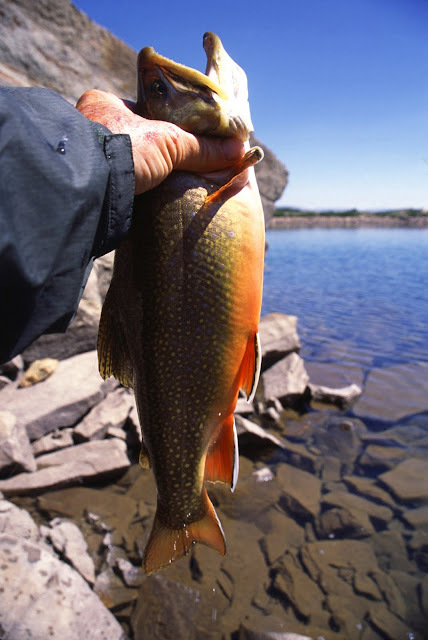 This lake produced this beautiful brook trout for me on my 27 day expedition in 2003. Smiths Fork, born in the Red Castle area on the North Slope, is also named in honor of Jedediah Smith, who along with his men first trapped the North Slope in the 1820’s. “Diah” as he was sometimes affectionately called was a giant among those early explorers different in that he carried (and read) his Bible, did not swear, nor drink and refused to have to do with women of ill repute. 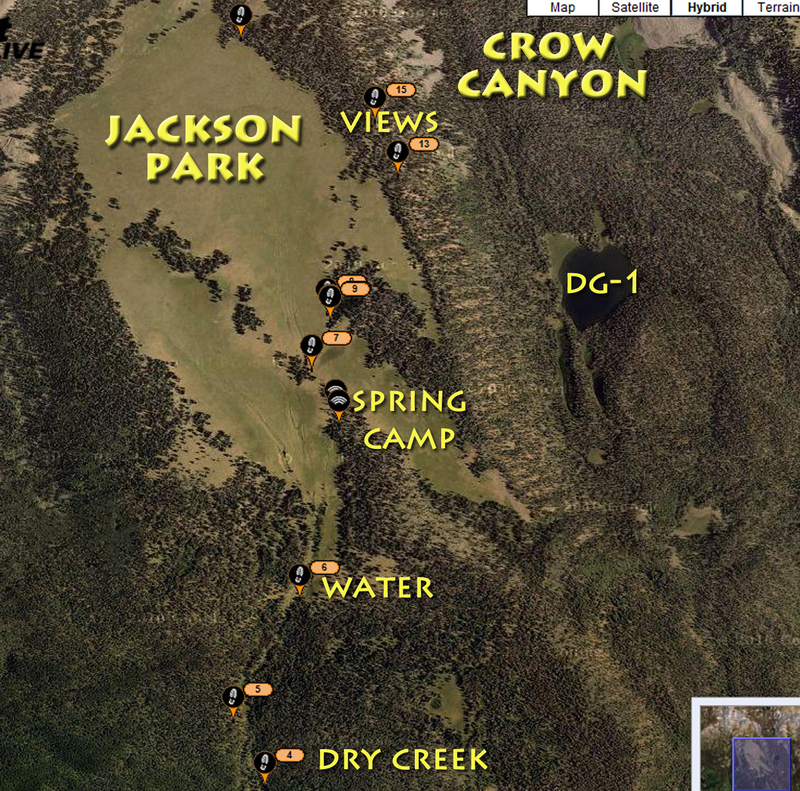 Now back to Jackson Park and Crow Canyon. As I proceeded up the Park I could see across Yellowstone Canyon to the West viewing Swasey Hole and the Garfield Basin. At a certain point I decided to move over to the edge of the Park and look down into Crow Canyon. There was a lot of downed timber, but through it to the edge I could see a lake to the south. I was viewing it from SPOT track #13. I then looked to the northeast and could see another lake. 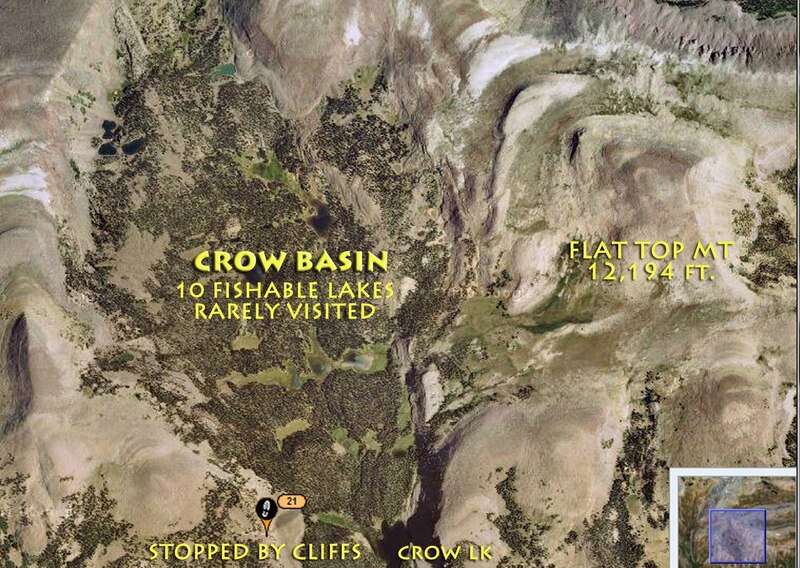 I zoomed in and looking on my Google Earth print-out could see that it was Crow Lake. It was not a “hop, skip and a jump” down into the canyon to Crow Lake. It was a very steep slide down, and full of dead timber, all adding up to a tangled, steep mountain that would give me great difficulty with a pack on my back. Oh, I could get down, but I had to be smart realizing that getting back out would be the problem. I moved a bit further north, to SPOT track #15 where I could get a clear view of Crow Lake. 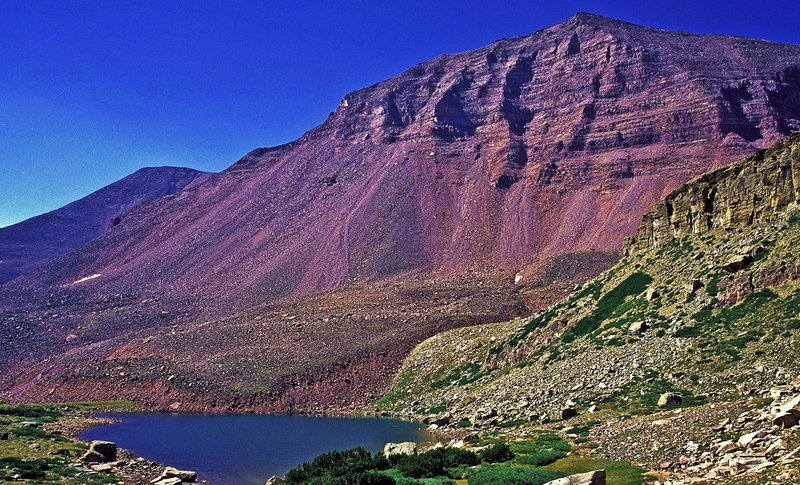 12,149 ft. Flat Top Mountain was guarding Crow Lake. Flat Top Mt. pass to the north east apparently has a stock trail that comes from Lily Lake. This pass also leads to remote Bollie Lake to the east even though there is no trail. There is a faint sheep herder trail leading to Bollie Lake from the top of the switchbacks on the Uinta River–Chain Lakes/Atwood trail. It was getting towards time to think of setting up my camp, but hadn’t found any water up high, and of course had ruled out trying to get down into Crow Canyon, so I headed back down Jackson Park looking for the origin of the small stream where I had got water in the morning. Along the way stumbled on the remains of one critter who maybe didn’t get to the water in time, or likely had some other mishap. I came to water and followed it up into a grove of pines where it sprung out of the ground. There I found the only wood sign of the trip. The bottom part of the sign says TIMOTHY LAKES 13 miles. I set up my little camp. Here you see my 2 man TarpTent that was sold by Gossamer Gear a few years back. It then became known as the Squall Classic. Today a take-off from this, but for just 1 person, is called THE ONE. Click on that link to see details. You can see that my tent is for 2 people–which I like so I can put most of my equipment inside with me. Inside you can see my Therm-A-Rest NeoAir mattress, and the Golite quilt sleeping system. Click on those links for details. They are both extremely lightweight and the best. There has been a tongue-in-cheek rumor in the Uintas since my expedition in 2003 that I am the reincarnation of Jedediah Smith, however the theme of fire-making easily proves I’m not in the “flint/tinder” fire-making club he was in. I now go for the incredible “tenderfoot” system you see above, with COGHLAN’S FIRE PASTE, and STORMPROOF MATCHES. What a snap! Just squirt a little paste under your dry twigs. The match lights easily and burns long and will not be put out by the wind. This is the usual scene in the Uintas, with a tangle of dead firewood everywhere. You don’t need an axe, nor a saw. But a warning: In the Wilderness Area you can not make a fire withnin 1/4 mile of a lake. In some areas, like The Naturalist Basin, you can’t light a fire anywhere. There are high traffic areas where all the dead wood has been gathered and used and these areas need to be left alone for 50 years or so to return to their natural state for the good of wildlife and the natural environment. Also in the Wilderness Area you can’t camp within 200 feet of a trail, a lake or a stream. So keep on your toes to help maintain the wilderness. I only make one small fire a day at dinner time. In this instance it was to cook for 10 minutes my scalloped potato meal. Cooking time for rice, etc. can be reduced by putting your meal to soak for an hour or so. A fish cooked in aluminum foil will also only take 10 minutes and much of the cooking can be from the heat of the coals after the burning has stopped. While the potatoes were cooking I mixed my egg nog, and my chocolate pudding. That along with a handful of wheat thins was my dinner. By the way, I don’t go backpacking to eat, cook, dirty a bunch of dishes I have to wash, etc. So keep it simple. The next morning the fire spot was cleaned up LEAVING NO TRACE. The morning saw me heading up the Park again, seeing a bit more clearly Swasey Hole off to the west. Up near the top while resting elk began wandering out in the park. Can you see them? Maybe it will help to click on the photo. One gradually grazed towards me. Soon I could see it was a young bull. This was a moment when I wished I had my Nikon D-200 with 450 mm. telephoto lens. The digital zoom in the little Pentax Optio was fine to about half of the maximum, then it got bad. Still a worthwhile shot or two. He was about to go into the forest so I made a sound to spook him. Off he went to hook up with his buddies on the other side of the Park. I did the last 100 yards or so to the top of the Park and followed a trail towards Crow Basin. There, again, I found the bones of a critter who didn’t make it. All of a sudden I was happily cruising down a gradually sloping meadow leading towards Crow Basin, with Flat Top Mountain perfectly framed. Wow, this was great just sort of coasting into the upper basin! But, all of a sudden the dream was dashed by a wall of cliffs, and boulder fields. So I was stopped at SPOT track l#21, but hoped to at least be able to get photos of many of the lakes. Looking south I could see DG-1 and for me impassable terrain. I scouted down a ways to see if there was a place, but none safe enough for me. In the middle basin it was much the same, if not worse. To look down gave me that butterfly feeling in the pit of my stomach. I guess I’m getting old after all. Glancing up, towards the north and the upper basin it even looked tougher, but I thought that if I climbed up there maybe I would be able to see some of the 8 or 9 lakes up there. I prepared to hike up as far as possible, leaving my pack there at track #21. Notice that I clipped on my belt my SPOT Tracker. You can’t relax and get separated from this incredible little device that could save your life–or at least signal where the family could find your remains so they could collect the inheritance and insurance money without excessive expense! This was my trail up to the top. My Mountain Running shoes were fantastic in making me nimble and quick to maneuver this kind of terrain. I didn’t quite get as high as I wanted, but a drop or two or rain warned me to hurry, so I clicked off a shot, showing a couple of the lakes that were now visible. Here I pinpoint where all of the lakes are in the upper basin. Flat Top Mt. from up high. Of course I couldn’t pass on clicking off a shot of this luminescent quality paintbrush flower. I hurried on to my pack that was a bit wet, shouldered it and headed for cover. I had got just a touch wet in all of this, but not bad, yet the rain came harder and harder, then turned to hail, and the temperature plunged. It reminded me of an extreme situation I went through a few years ago when I found myself on the verge or hypothermia. I have a profound respect for mother nature and go prepared to confront any dangerous situation that she throws at me–always trying to keep one step ahead of her to protect myself and have survival on my side.. I had to keep hypothermia from happening and needed to get my poncho on and begin moving to keep my body warm. I got my poncho out and moved out of the tree cover. I was trying to hurry a bit too much as the rain was pretty hard, and as I gathered the poncho and threw it over my head and pack I lost my balance, which hasn’t been too good in recent years. 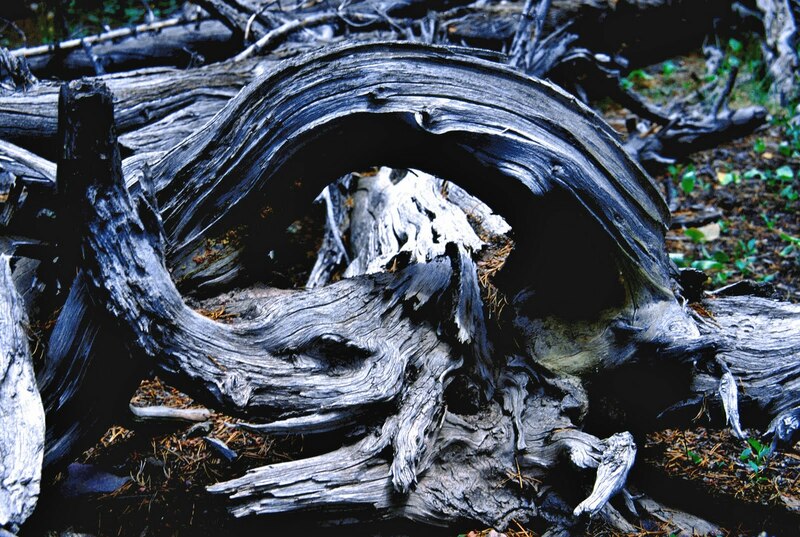 I stumbled backwards over a dead log with its roots clawing at me. It wasn’t the one you see below–which shot I insert since I didn’t think to afterwards take a picture of the real thing. I fell backwards over the log with my pack on and as I whirled around trying to protect myself got my left foot caught in the roots so that when I went down over the log my toe was snagged and as I fell backwards with all my weight and that of the pack my foot and ankle were bent back with tremendous force and I was sure it had to be broken as there was no way it could have withstood so much pressure. That prayer calmed me some and I should have thought to pull my camera out and take some pictures, but of course survival was a bit on my mind. I was sure my ankle was broken, but first I had to get rid of my pack and have the hope of then freeing myself from the root. I wiggled out of the pack and after repeated attempts to contort my body up and grab for a root, I finally got one and pulled myself up on the log and finally was able to free my foot. It wasn’t broken, nor did I feel any pain at all. “Thanks, Lord, again for giving me strength and resistance.” I had been so convinced that the violent action and pressure had to have broken something, but to be freed and have no pain, seemed like the miracle of miracles. It would be worthwhile for you to check out the article referred to above on my website, WHERE DO YOU GET SO MUCH ENERGY, and click on the links therein and start taking some of the key supplements that have saved my life. During all of that the rain had persisted in pouring down, so me and equipment were pretty wet. Even over wet clothes I put on the lightweight yellow rain gear, then shouldered my pack and successfully got my poncho on covering me and pack. I headed up , actually looking for a place where I could somehow set up my tent and get some protection. But there was just too much water everywhere so I kept moving when up at the highest point near Jackson Park the lightning and thunder began a vicious onslaught like I had never experienced. The blasts of thunder and lightning hit exactly at the same instant indicating that it was right on top of me. I moved under the smaller, shorter trees avoiding totally being in the open. 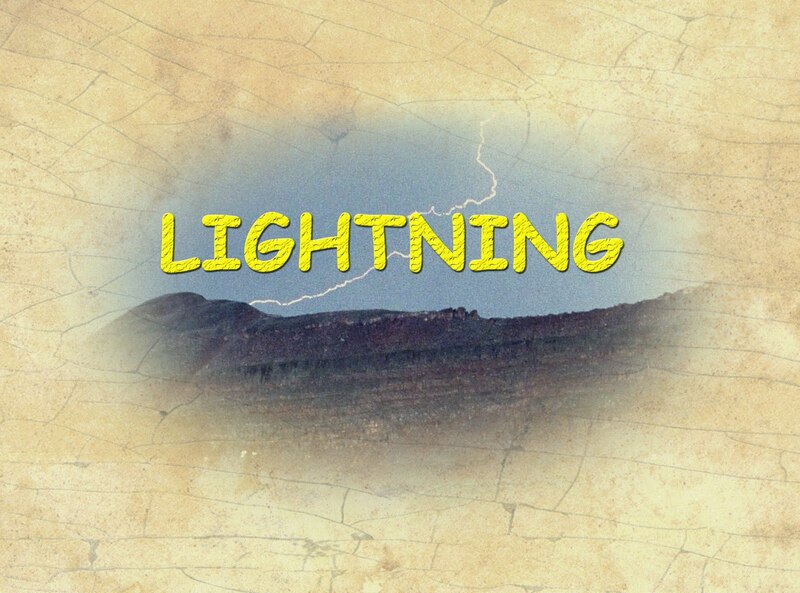 One violent discharge literally shook the ground and had wavy wisps of electricity dancing around me. I had decided to head down the mountain, but I couldn’t venture out in the open to cross the Park. I stuck to the fringes moving south. Eventually the storm passed and the sun came out, and I quickly made it to the previous camping spot and source of good water. I spread my wet gear out to dry some, filled up with good water, mixed a couple of bottles of egg nog, and one of Endurox/Cal/Mag/Gatorade. 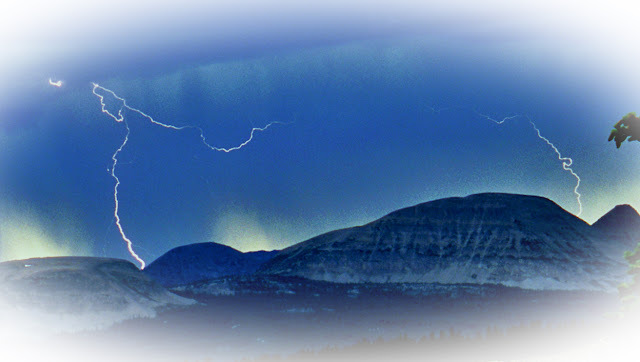 Then a dark lightning filled sky approached from the north, and I moved fast down the mountain to the south. In 5 miles I only slowed a few times to down egg nog, then Endurox, and once an hour popped an FRS energy chew in my mouth. They are promoted by Lance Armstrong and I have found them very effective to increase energy, stamina and endurance. I was pretty tired moving down the mountain, as the braking action was fatiguing and so I stopped once to rest for a few minutes. That resulted in me having to quickly put my poncho back on about 200 yards from the car. But I made it, doing at least 6 miles from Jackson Park, and a bit more than 10 miles on the day. I moved down the road quickly before the rain turned it into a quagmire and happily got to the pavement . I hoped to get some food at the Rock Creek Store, but they were closed and so I went on to Duchesne, gased up, got some good food and headed up the highway. 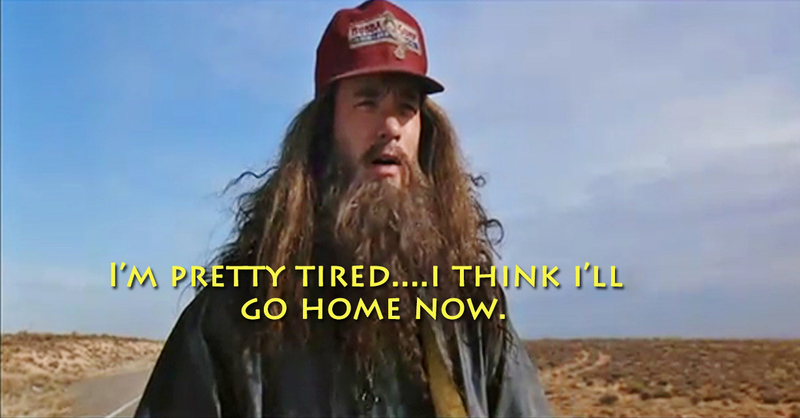 I was worn out but grateful to have made it through quite an eventful day–to say the least. Fatigue go the best of me so up in the coolness of Strawberry Reservoir I stopped at the Strawberry River rest area and camped. 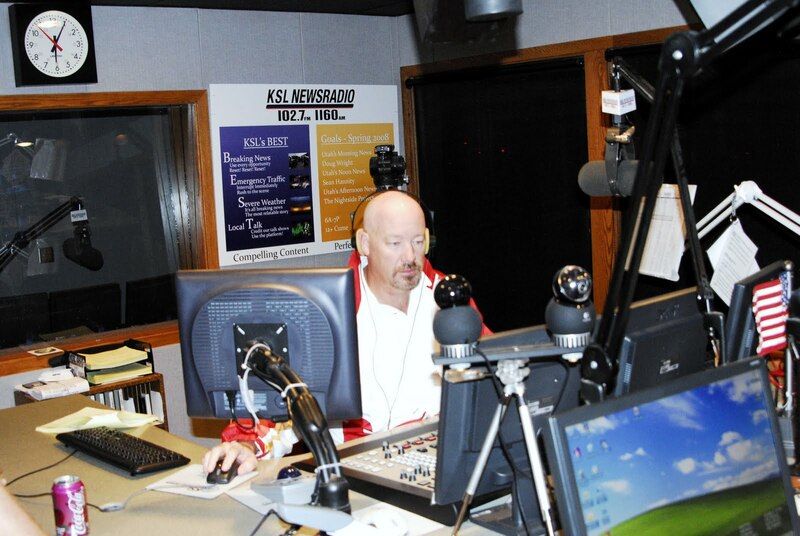 It was from here on Saturday morning that I warmed up the sat phone and made my call to KSL OUTDOORS Radio. In the interest of full disclosure, Tim, and Navi, my report to you that morning was from Strawberry as explained here–and it was cold that morning there. As my backpacking is finished for this season, I want to thank Tim, Russ, Jeff and Navi for the great public service you perform through KSL OUTDOORS Radio. Special thanks to Russ and Skycall Satellite for providing me a phone for the summer. I hope that my encouraging everyone to be safe in the outdoors by using a SPOT tracker, and a sat phone, gives a boost to your business, saves a few lives, and provides comfort to loved ones at home by receiving the OK message from loved ones each day while they are in the wilderness. I will continue with my research and effort to put my whole project together, so will check in from time to time and always be listening. I will confess that recently this has not been quite as easy as it was back a few years. At times I have sort of “tongue in cheek” thought about Forest Gump and his experience running around the country for 3 years, and likened my 9 years and 1,500 miles of backpacking to his experience. I call that “The Forest Gump moment.” I have experienced it several times, including during this trip report I’m giving you. So, I might just do another backpack next year–and it will likely be to finally make it to Crow Basin. 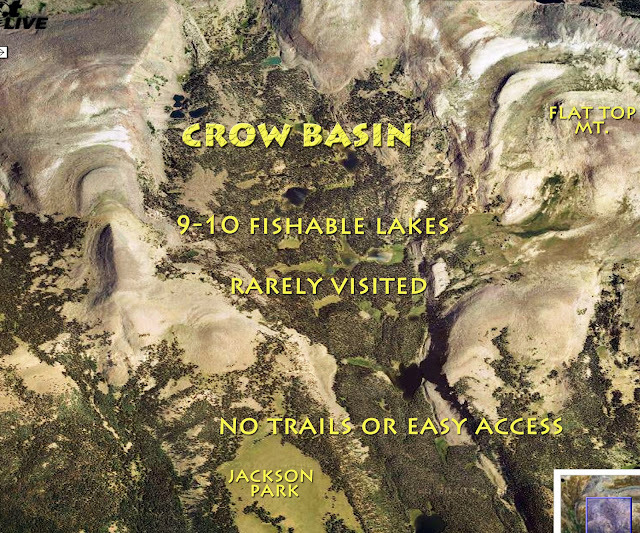 Of course you young bucks out there could decide to beat me to Crow Basin, which would be fine. Just get to me a good report with photos I can put up on my website. So there’s a challenge I give to some of you, my High Uinta Friends. Let’s all do our darndest to KEEP MOVING, NOT GIVE IN and learn to ENJOY SAFELY THE GREAT OUTDOORS! Hey, and check out all the great equipment and supplements I have given you links to. They will help us hang in there and survive, so get the stuff you need from these links and in that way help the High Uintas Project and all of us to keep going. Crow Basin-Dry Gulch REPORT — NEVER GIVE UP! WOW…JACKSON PARK/CROW CANYON..SAW IT! SURVIVED IT! NEXT? ALMOST “SPOT 911” … Prepare to Beat the Odds! In the meantime you can see what I did on SPOT TRACK Trip #7 clicking on Hybrid and zeroing in to see all the details. WERE YOU SUPER-OBSERVANT?–Following SPOT Tracking? After 2 miles of one tough jeep road for my small SUV I parked and started a tough hike up into unknown territory where eventually I would have to leave the trail and navigate down into a trail-less box canyon and Crow Basin. I left home my 13 lbs. of photo equipment and went with my tiny Pentax water-proof point and shoot camera, but did have on my waist my Colt .45 Defender. Absent around my waist for the first time in 1,470 miles of backpacking is my photo waist pack. No tripod either, nor heavy extra batteries, etc. 13 pounds for each of the 26,000 steps taken in a half-marathon adds up to 338,000 pounds less weight lifted! In an afternoon of hiking I made around 4.5 miles, but felt like it was much more. From there the next morning I made my report via sat phone to KSL Outdoors (at the 6:35 point). 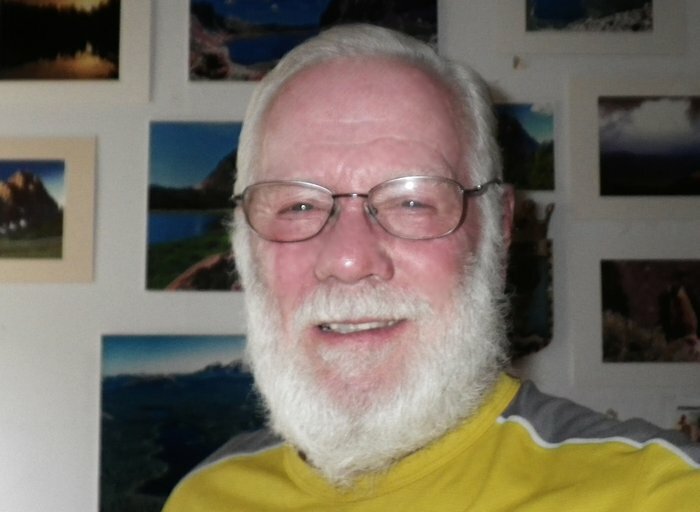 Afterwards, seeing where I thought I had to go still, I wondered if this old 76 year old mountain man could do it. I should have had a GPS to know exactly where I was, but did hit my SPOT tracker–so later at home I knew where I had been, and that I had been closer than imagined. But, I decided on another option for the trip and headed back to the car. My SPOT tracks reveal I had aborted the original plan and wandered east checking out the Dry Gulch Road, and then crossed Indian Lands to the Uinta River Trailhead. From there I made a big swing up and around the previously unknown Whiterocks Drainage–clear up to where the Highline Trail goes by Chepeta Lake. It was from there that the 64 year old Austrailian had left to head West and to date is still lost. I will eventually give you a report on this area–outside the Wilderness Area, and a guide to help you all enjoy it. 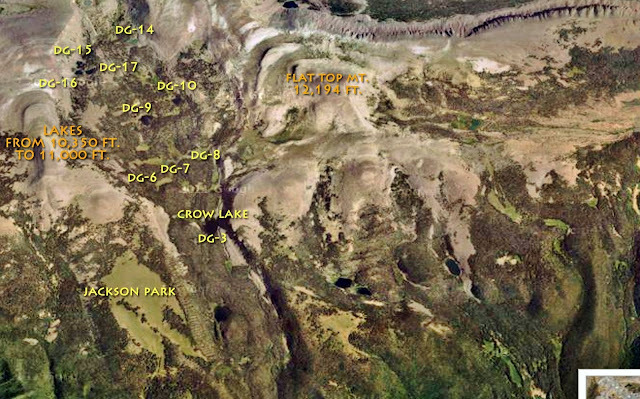 Upper Whiterocks Drainage panorama showing on left Fox/Queant Pass, then in center, North Pole Pass and on far right the Chepeta Lake area. Vernal and that high country area, the brakes got worse and so in wisdom I turned around and headed for my Springville home and the wonderful Johnson family repair shop. The master cylinder needed to be replaced–now done, so I’ll head out tomorrow (Wed. 8/17) to do the Crow Basin thing–NOT GIVING UP! (or GIVING IN as said famously by Winston Churchill). Above shows the Crow Basin target area, and where I started and where I got to (#2 and then tracks #4, #5, and #6 on the return to the car). 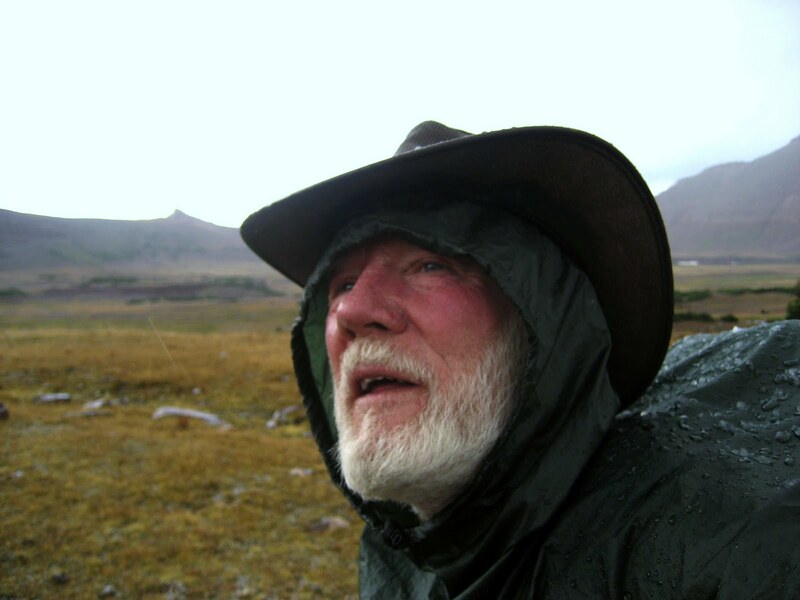 The 64 year old lost in the Uintas had a Personal Locater Beacon, but apparently wasn’t using it. 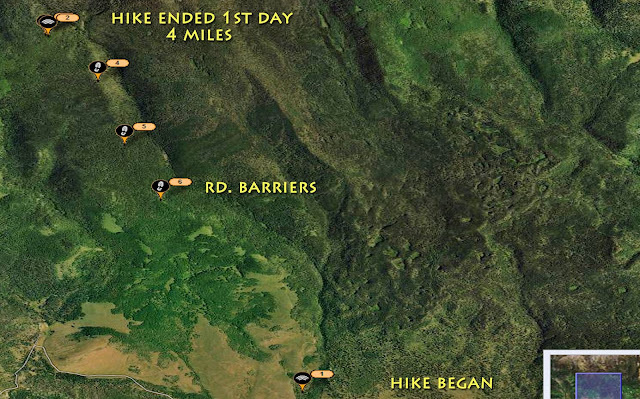 With a SPOT Tracker, key locations along one’s trail can be marked and found easily by the friends on one’s message list and Search and Rescue–as seen above. Don’t go without one as shown on the right panel–clicking there, you can get one cheaper than anywhere and earn for the High Uintas Project a small commission. Above shows SPOT Track #2, where I had got to. From there another mile and I would have been to Jackson Park where the trail ends. 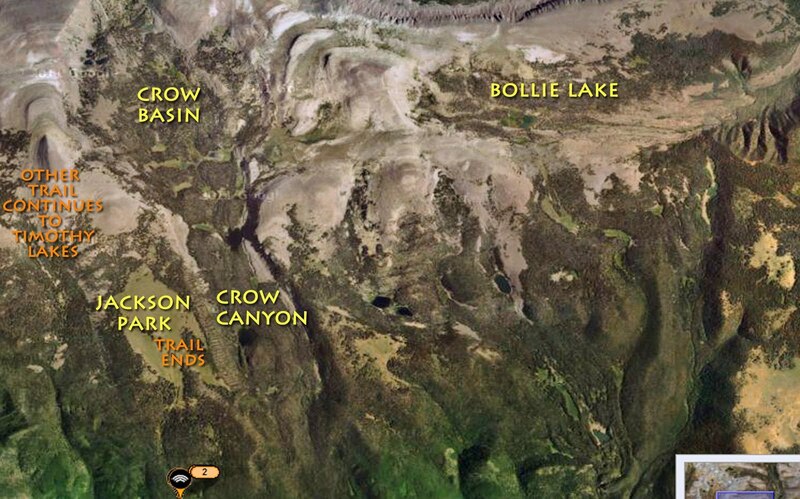 From there I will have to find the right spot to bushwack/boulder hop down into Crow Canyon and 10,350 ft. high Crow Lake and from there explore the lakes up to timberline and the 11,000 ft. high DG-14 lake. I AT LEAST WILL ONLY GIVE UP WITH GREAT DIFFICULTY! Click on SPOT TRACK to follow me in this exploration. Once again I will give my sat phone report to KSL OUTDOORS Saturday morning from somewhere up in the high country. It’s not Skycall Communications anymore, rather SKYCALL SATELLITE, but the phone numbers all work still as do the highlighted links. I will be leaving early Friday for this trip that was impossible early in the season. Podcast report on KSL OUTDOORS Radio Saturday 8/13 from Dry Gulch at about 6:35 a.m. Your friend and High Uinta friend, Nick Gough . Nick is second from the left. On the far left is Matt Jenkins, then to the right, Scott Jenkins and Andrew Larson. They will be coming out today, Saturday, August 6th, and get me their report that I will post here. The “trail” going in was in very poor condition, in most cases it would just disappear once we got going on it. Luckily its easy to just keep pushing South-West towards bald mountain. The wet season this year, coupled with all the cattle in this area made for a boggy hike most the way. The bushwhack from Highline trail to the lake itself, was surprisingly the best part. We had the lake to ourselves for two full days, which was amazing. Theres a great secluded campsite that I learned about from Nick Wooleyhttp://backcountrypost.com/ on the South East side of the lake. Fishing was fast for native Brookies. Nothing over 11 inches though. Huge snow banks are still covering the face of bald mountain along the top, including some snow fields on the south side of the lake, which we day hiked across to reach the top of 12,000′ Bald mountain from which we clearly viewed the Red Castle lakes area, along with Mt. Powell, Flat Top Mountain, and Tokewanna Peak. Aside from getting hailed on briefly a couple times, the weather was incredible the whole time, with sunny skies and just enough wind to keep the bugs down. We saw all the tie hacker cabins along the way, which was very cool. Thanks for the information that made this trip a great success! I did see the photo and mention of my group! Thanks for the recognition. From left to right: Matt Jenkins, me, Scott Jenkins, Andrew Larsen. We go on a trip together every year. Last year we got snowed on in the Wind Rivers, so this was a great way to redeem ourselves! Thanks for all the great information on your website. It truly is an inspiration and motivation for me to get out with friends and family more. Thanks, NICK, for the report and the beautiful photos. Be in touch. Click here to see the Trip #4 SURVIVAL at Swasey Hole video. I had to divide the Tie Hacker Tour video into two parts, each just 10 minutes long. PART 1 and PART 2 are now up and running. NOTE: For more details and many more photographs of each trip and the sites visited, go to the Articles section and look at each of the 6 or 7 Tie Hacker reports. This will likely be the opening for the YouTube video–that will take you to each of the known, and some “not known” sites and show you a little of each. It will be done before Sunday is gone. I’ll let you know. Click on the image to enlarge. Scroll down for Nick Gough and crew backpacking to Bald Lake. While on the Tie Hack Tour I noticed a Toyota pickup full of tough backpackers looking for something. They eventually followed me into the unmarked road (just east of Steel Ck.) to the Hewinta Guard Station. I stopped to hike into the Steel Creek Commissary tie hack site when they pulled up. One came tumbling out and introduced himself as “High Uinta Friend Nick Gough!” From my website he knew I would be on the North Slope, and we found each other. They were looking for the little known and even less used West Fork Smith’s Fork Trailhead to head to Bald Lake–as suggested by my trip there in 2008 (Trip #5-2008). Later at the Trailhead I got their picture. The register pages were unmarked–and soaking wet, so it looked like they would be the first into the area for 2011. Tune in to KSL OUTDOORS Radio online each Saturday morning from 6:00-8:00 a.m. 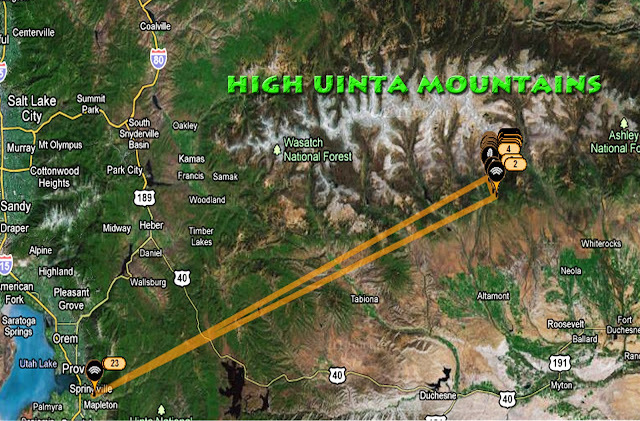 I will be leaving on Tuesday afternoon, August 2nd, for the North Slope of the Uintas and Southern Wyoming to revisit all the known tie hacker sites and those unknown which I have discovered –to review dating calculations and other details, and do research at Southern Wyoming libraries and the Union Pacific Railroad. 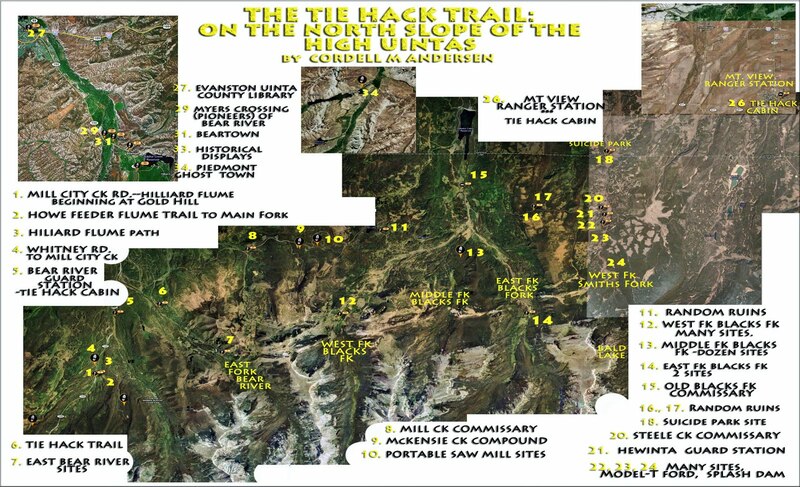 If you are new and don’t know about the tie hackers–“unsung American heroes,” go to the articles page where I list 7 reports. In fact I will create a new category labeling all of them so they will show on each page under OTHER TOPICS. I will do my best to report in to KSL OUTDOORS Radio on Saturday morning at about 6:40 a.m. You can listen online to the program clicking on the highlighted link above. YouTube chose the cover photo of Joe Pratt and son, Carter, new High Uinta Friends. NOTE: I removed this video from its previous channel, and uploaded it to the “quijote 1936” one where all my other videos are. Previously it had 139 viewers. 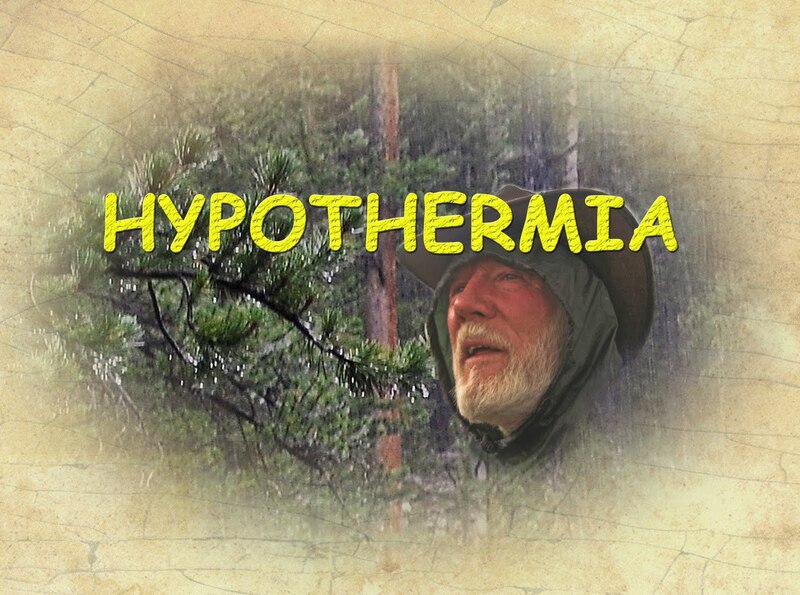 I had posted here for a while that I would be leaving today (Friday) for the North Slope doing more investigation and exploration on “my heroes” the Tie Hackers, but I’m still experiencing a little health problem from the above described survival experience. So I’ll wait a day or two and hit it next week–when I can also get up to the Library in Evanston and the Union Pacific Railroad seeking original sources on the early Tie Hacker period (1867-1880). That will give a little time for the mosquitoes to calm down a bit so I can hit the last drainage never visited yet–The Dry Gulch Drainage and Crow Canyon, which I will do even if the jeep road is still bad–I’ll just hike a few extra miles. Along those lines of hiking a bit extra, in all the above survival experience, thanks to the Lord, my legs were strong and never even trembled when fatigued, and no balance and agility problems either. My heart, that has given me fits a time or two (as described in some of my Survival experiences), never showed any signs of weakness–so I’M GOOD TO GO STILL! 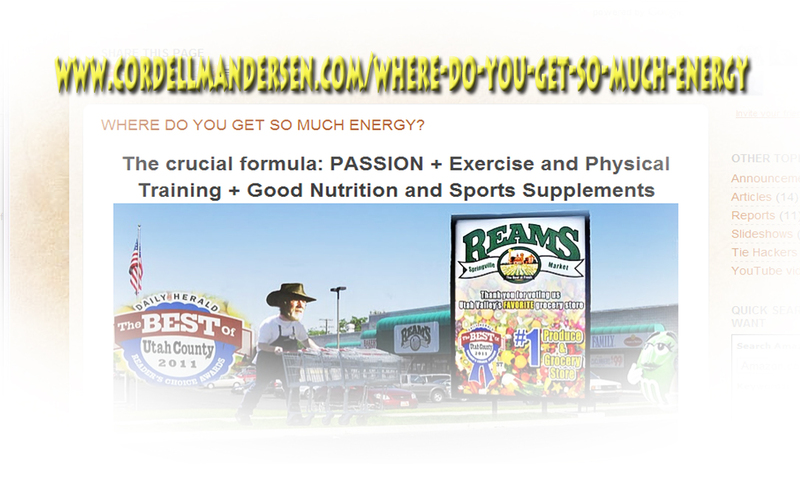 Check out my article on ENERGY that has all the links to the supplements that give us new life! 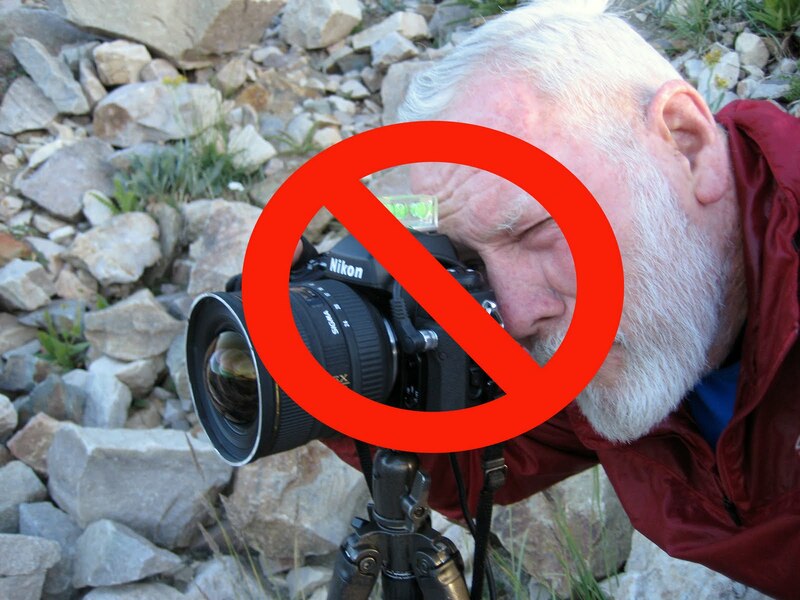 NOTE: The following email message was received from “High Uintas Friend” Rusty Swenson and reproduced here with his permission– with his photos interspersed, ending with a short 360 degree video from Rocky Sea Pass. to head up over Rocky Sea Pass for the first time to try my luck in the Upper Rock Creek area. Looking east with Explorer Peak showing on the left center–and snow bank showing that you have to navigate to switchback down into the Rock Creek Drainage. I took a trip to the Upper Rock Creek area this week, just got back today. I was surprised at how quiet the area was, as I didn’t see a soul for two days while beyond Rocky Sea Pass. View from Rocky Sea Pass looking towards Hades Pass in left center and West Grandaddy Mt. in the center. HAS THE OLD EXPLORER/MOUNTAIN MAN FINALLY EXPIRED? 2018 PLANS FOR THIS OLD BACKPACKER! Merrill Finlayson on BACKPACK/EXPLORATION #2 – 2017 To THE GRANDADDIES & JEFF LAKE & The HIGHLINE TRAIL for 2018?